Mr. Bill Bowtell, Executive Director of Pacific Friends of the Global Fund to Fight AIDS, Tuberculosis and Malaria has warmly endorsed the Turnbull government’s plan to rid the Asia Pacific of malaria by 2030. At the East Asia Summit held in Kuala Lumpur over the past weekend, Prime Minister Malcolm Turnbull announced that the Australian government will provide an additional $6 million towards the East Asian regional plan to eradicate malaria from the Asia Pacific. “The Prime Minister’s commitment is both practical and visionary. The eradication of malaria will not only save millions of people from preventable suffering and early death, but also provides a stimulus to economic growth and promotes health security for our friends and neighbours”, said Mr. Bowtell. “We hope that Prime Minister Turnbull will continue to serve as Co-Chair of the Asia Pacific Leaders’ Malaria Alliance (APLMA) in order to oversee the implementation of this exceptional policy commitment”. Malaria is a mosquito-borne disease. It is preventable and treatable, however it still claims over 50,000 lives each year in the Asia Pacific region. “Between 2000 and 2013, thanks to increased funding and better strategies, the global malaria mortality rate has fallen by almost 50%, but we are seeing the emergence of new forms of drug-resistant malaria, especially in the Mekong region”. This presents new challenges, but with increased funding of new treatments and preventive measures, eradication of malaria in the Mekong region is now an achievable goal. Malaria is caused by a parasite called Plasmodium, which is transmitted via the bites of infected mosquitoes. If not treated, malaria can quickly become life-threatening by disrupting the blood supply to vital organs. Malaria claims over 50,000 lives each year in the Asia Pacific region and 600,000 globally. New drug-resistant forms of malaria are emerging, especially in the Mekong region. Preventive measures like the use of insecticide and mosquito nets have helped reduce mortality from malaria. Improved funding and strategies reduced the global malaria mortality rate by almost 48% between 2000 and 2013. Children and pregnant women are particularly vulnerable. In 2013 over three-quarters of all malaria deaths were in children under the age of five. Half of the world’s population remains vulnerable to malaria. The Global Fund is a 21st-century partnership organization designed to accelerate the end of AIDS, tuberculosis and malaria as epidemics. Founded in 2002, the Global Fund is a partnership between governments, civil society, the private sector and people affected by the diseases. The Global Fund raises and invests nearly US$4 billion a year to support programs run by local experts in countries and communities most in need. Prevention involves the distribution of insecticide-treated nets, the use of indoor residual spraying of households and, if appropriate, interventions targeting the larval stages of the mosquito. For example, in Sri Lanka, larvivorous (larvae-eating) fish were introduced to bodies of water where mosquitoes normally breed. Through the middle of 2015, programs supported by the Global Fund had distributed 548 million nets to protect families. 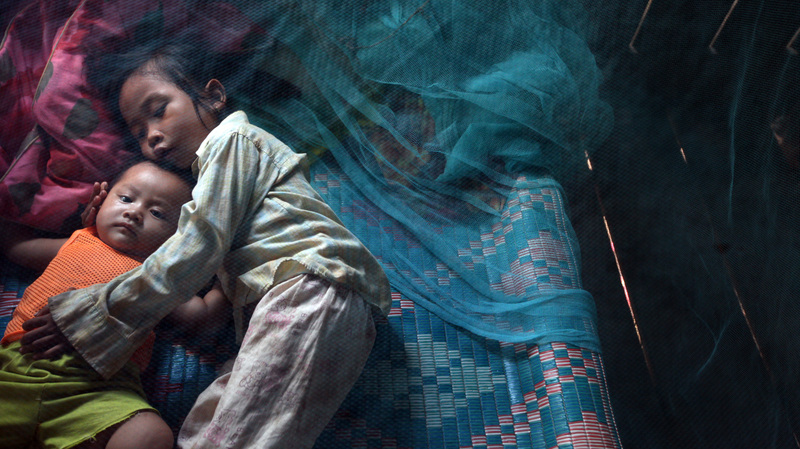 Sleeping under an insecticide-treated net halves malaria cases among children. As of mid 2015, programs supported by the Global Fund had provided 515 million treatments for malaria. In the last decade, we have seen the introduction of artemisinin-based combination therapies (ACTs), a new generation of antimalarial treatment that are highly effective. Unfortunately, however, we are already seeing resistance to the key ingredient, artemisinin, (as well as the partner drugs) develop in certain parts of the world. This is one of the great challenges facing us in the fight against malaria. The Regional Artemisinin Resistance Initiative (RAI) will support purchase of long-lasting impregnated nets, malaria case detection and provision of directly observed antimalarial treatment in Cambodia, Laos, Myanmar, Thailand and Vietnam, as well as regional and national advocacy and awareness campaigns. A disease burden and financial gap analysis led funds to be allocated as follows: 15% to the regional campaigns; 15% to Cambodia; 5% to Laos; 40% to Myanmar; 10% to Thailand; and 15% to Vietnam. Central to the outreach component of RAI is work to reach migrant populations living and working in border areas who are normally overlooked and often marginalized. Each country has committed to complementary national campaigns targeting these populations. Parasite resistance to artemisinin has been detected in all of the RAI countries, which has provoked concerns among malaria clinicians and researchers that a currently small problem could multiply exponentially and become a grave danger both within the region and beyond. The risks presented by this growing resistance to artemisinin – the primary ingredient in combination therapies that have demonstrated the greatest success in treating malaria – drove the speed and deliberation with which the RAI proposal was achieved, according to RAI program manager Izaskun Gaviria. “Artemisinin resistance is regarded as a global threat by the international community, which allowed the team to benefit from great support from key partners,” Gaviria said in an emailed response to Aidspan questions. The split between regional behavior change and outreach activities and national-level service delivery was also a product of wide consultations with a variety of stakeholders including civil society groups, Gaviria said. It also reflects national and international priorities to coordinate with other regional initiatives on malaria funded by donors including The Bill and Melinda Gates Foundation, AusAID and DFiD. RAI is one of three regional early applicants under the NFM. The other two are a malaria initiative in Mesoamerica and Hispaniola, EMMIE, that will strengthen malaria surveillance in Dominican Republic, Haiti, Panama, Costa Rica, Nicaragua, Guatemala, Belize and El Salvador; and a regional HIV harm reduction initiative stewarded by the Eurasian Harm Reduction Network in Eastern Europe and Central Asia. A total of $116 million was initially envisioned under the transition phase for these three regional initiatives. After Dramatic Decline in Malaria Deaths in Africa, Scientists Plan for Final Eradication: How to win the Endgame Against an Ancient Foe? In South Africa, which hopes to eliminate malaria by 2018, tracking the total number of infections, recording where they are occurring and following-up to confirm details such as travel history and symptoms is a cornerstone of the country’s elimination strategy. South Africa’s intensive malaria surveillance program includes a website that is constantly updated and features an outbreak alert system and an automated mapping program that can depict malaria cases down to the local level. Meanwhile, researchers from Namibia presented a study that highlights the importance of cross-border initiatives for countries targeting elimination. They noted that most of the malaria cases in northern Namibia are “imported from southern Angola.” The study examined the effectiveness of a program—the Trans Kunene Malaria Initiative—that implemented a host of interventions in a 20-square kilometer region on both sides of the Namibia-Angola border. The interventions included long-lasting insecticide treated bed nets, rapid diagnostic tests, community education and case management. Also, both governments agreed to remove customs duties from malaria “commodities,” including bed nets and chemicals used for indoor spraying programs. The study, presented at MIM and led by Constance Njovu with the JC Flowers Foundation’s Isdell:Flowers Cross Border Malaria Initiative, noted that both areas targeted achieved a significant reduction in malaria. “These results show that cross-border work is both critical to elimination of malaria and possible despite (involving) different national governments with language and cultural differences,” the scientists reported. Meanwhile, researchers from the University of Pretoria focused on developing “sustainable” tools for malaria control, which they view as crucial to creating more durable reduction in illness and death and thus a more stable platform from which to pursue malaria eradication. The CSMC’s Taneshka Kruger along with colleagues at the University’s Institute of Applied Materials sought to address limits to bed nets and indoor spraying as control measures: one has to be sleeping under a bed net to enjoy its protection, they noted, while indoor spraying is costly and raises fears of exposure to toxic chemicals. They found that lining interior doors with a mesh fabric treated with a slow-releasing insecticide was a safe, effective and potentially inexpensive form of long-lasting malaria control. Lines said that eliminating malaria in Africa requires confronting a range of confounding questions. For example, he noted that increasing access to things like insecticide treated nets and artemisinin combination therapies (ACTs), while crucial to saving lives and reducing disease transmission, comes at a cost: the more they are used, the faster mosquitoes and parasites are likely develop resistance. Also, he said that while malaria transmission patterns are “changing radically” across Africa, it’s not always clear why. For example, he said his research has documented that there was a significant decrease in malaria transmission in parts of Tanzania before these areas saw widespread use of insecticide treated nets. Meanwhile, in parts of Uganda and Malawi, he said transmission has remained intense despite aggressive use of bed nets and better access to effective medications. Lines said eliminating malaria in Africa requires a better understanding of the different factors affecting transmission and also more attention to disease surveillance. Such work is crucial, he said, to ensuring that once malaria is eliminated from a particular region, it doesn’t simply re-establish itself when an infected individual migrates from areas where malaria is still common. “The lesson you want to learn from areas that have eliminated malaria is not just how did you drive it out but how did you keep it out,” he said. He said elimination might ultimately need to involve some way of reducing the capacity of mosquitoes or humans to transmit the parasite. For example, there is work underway today to develop a vaccine that would interrupt the life-cycle of the malaria parasite by preventing it from passing from humans back to mosquitoes. Other efforts have focused on the potential of genetically modified mosquitoes that are rendered incapable of passing along the parasite. DURBAN, SOUTH AFRICA (10 OCTOBER 2013)—With widespread use of insecticide-treated nets, indoor spraying and potent malaria medications credited with dramatically reducing malaria deaths in Africa, experts at a major malaria conference discussed the potential to use this progress as a springboard for achieving eradication of a disease that still kills some 660,000 people each year—most of them young African children. Lines was one of several malaria experts discussing the road to malaria eradication in Africa at the Sixth Multilateral Initiative on Malaria (MIM) Pan-African Malaria Conference—the world’s largest gathering of malaria experts—taking place in Durban, South Africa, 6-11 October 2013. Presentations at MIM, including the symposium Lines chaired on “planning for the endgame in Africa,” highlighted how scientists are transitioning from eradication as a lofty aspiration to one that involves an operational plan on the ground.